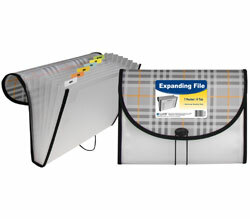 Colorful clipboard folder features durable construction and attractive sealed vinyl cover. Keeps papers protected. Clip holds pads or papers firmly in place. Folder features inside pocket. For 8-1/2 x 11 sheets. Holds 1 pad or up to 75 sheets. Assortment includes 6 each black, 3 each red and 3 each blue. Minimum purchase quantity is 12 units (one display).